COVINGTON, Ky. — The 152-year-old John A. Roebling Suspension Bridge has been closed to motorists indefinitely out of safety concerns. Sandstone fragments broke from the east side of the north tower Tuesday, according to Kentucky Transportation Cabinet officials. Emergency repairs could take a couple of weeks, KYTC officials said. 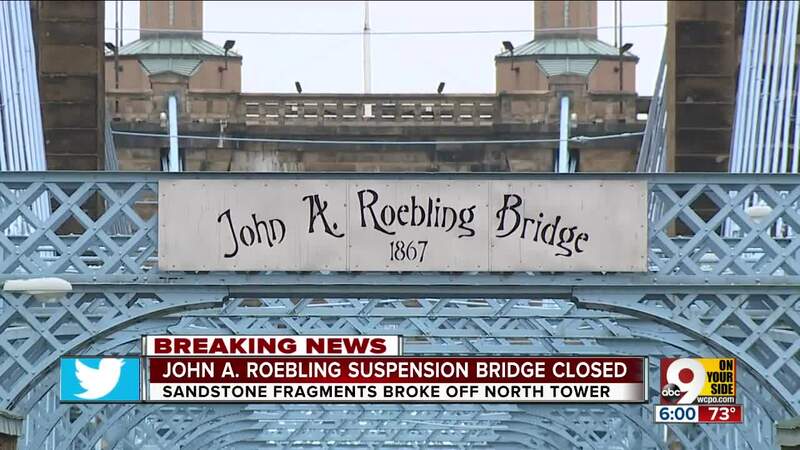 “Closing the Roebling Bridge is necessary to ensure the safety of vehicles and pedestrians from the potential of additional falling debris at a height of nearly eighty feet,” said Bob Yeager, chief district engineer for the Department of Highways District 6 office. The bridge, which carries more than 8,000 vehicles per day, was closed to motorists at 4 p.m. Wednesday. The east sidewalk is also closed. The west sidewalk remains open. Making emergency repairs to the historic bridge between Downtown and Covington is a more extensive process due to preservation requirements, KYTC officials said. A restoration project is in the design phase with construction expected to begin in the spring of 2020. A year ago, the bridge was closed for over a month for emergency repairs after a car hit one of the vertical columns. Drivers can use the Clay Wade Bailey Bridge between Cincinnati and Covington. Or take the Taylor Southgate Bridge between Cincinnati and Newport and cross the 4th Street/Veterans Bridge into or out of Covington.